The State of Washington, known for its beautiful vistas, green forests, and excellent fishing, also contains some of the most potentially dangerous volcanoes in the country. In 1980, for example, the formerly quiet Mount St. Helens erupted with a fantastic explosion. Today, organizations such as the Geologic Society of America suggest that Mount Rainier might be the next Mount St. Helens. The Mount St. Helens explosion resulted in some loss of life and property, but an explosion at Mount Rainier of the same or greater magnitude would be disastrous for the nearby Seattle-Tacoma metropolitan area. This area contains 2.5 million people, aircraft production facilities, and other critical installations. The United Nations designated the 1990s as the International Decade for Natural Disaster Reduction (IDNDR). 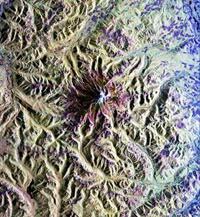 The Science and Technical Committee of IDNDR designated 14 Decade Volcanoes, including Mount Rainier, for extensive study to reduce threats to human life and development from natural hazards. Mount Rainier was chosen because its volcanic history includes lava flows, ash eruptions, avalanches, and mudflows. The mountain also has a huge buildup of snow and ice that could turn into devastating floods or mudflows. Mudflows are the most constant source of danger to the river valleys and lowlands around Mount Rainier. The largest recorded mudflow from Mount Rainier, the Osceola mudflow, occurred about 5,700 years ago when the northeastern section of Mount Rainier's summit broke free and began to slide down the mountainside. The resulting avalanche of rock and ice was quickly converted by frictional heat into a mass of mud with a volume of about 4 cubic kilometers. The mud traveled over 100 kilometers down the the White River valley to the shore of Puget Sound, into what is now the middle of the cities of Seattle and Tacoma. The Osceola mudflow covered about 500 square kilometers of land with a layer of mud ranging in thickness from a few meters on the coastal plains to as much as 100 meters along old river beds. While this particular event seems safely remote in time, Mount Rainier is known to have produced more than 50 major mudflows in the past 10,000 years. On average a major mudflow travels down the White River valley every 600 years. The next major mudflow could occur without warning at any time.